The beer industry in Mexico is dominated by two major players: Grupo Modelo and Cuauhtémoc-Moctezuma, the brewing division of Femsa (Fomento Económico Mexicano). In 2011, Mexico’s breweries produced 79 million hectoliters of beer, of which Grupo Modelo was responsible for 59%, and Cuauhtémoc-Moctezuma about 25%. Between 1991 and 2011, production had almost doubled, increasing by 92.6%. The record year was 2008, when 82 million hectoliters were produced. 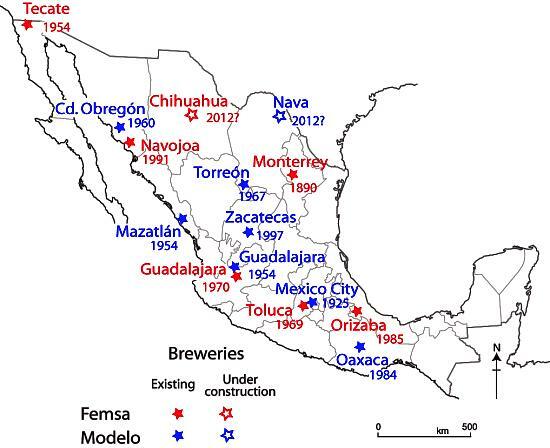 The map shows the locations of the major breweries belonging to Grupo Modelo and Cuauhtémoc-Moctezuma (Femsa), as of mid-2012. Grupo Modelo produces 13 brands, including Corona, Modelo Especial, Negra Modelo, Pacífico, Victoria, Estrellita and León. Its international sales rose 4.7% in 2011 to about $2.8 billion. Its best selling brand abroad is Corona Extra, the leading Mexican beer in the USA, while its Modelo Especial brand is that country’s third most popular brand. Corona is the leading import brand in some 40 countries, including Australia and Canada. Grupo Modelo (2011 net sales $6.5 billion) has a presence in about 180 countries. 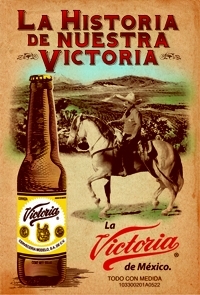 Cuauhtémoc-Moctezuma produces 21 brands, including Tecate, Carta Blanca, Superior, Sol, Indio, Bohemia, Dos Equis and Noche Buena. It sells to 50 countries. The division represents 23.5% of the total revenues of parent company Femsa (Fomento Económico Mexicano). The most significant changes in the beer industry are in ownership. In 2010, Dutch brewer Heineken bought 100% of the shares of Cuauhtémoc-Moctezuma, Mexico’s oldest brewer, created in 1890. Now, it has been announced that Grupo Modelo, founded in 1925, is being bought by Belgian-US brewing company Anheuser-Busch InBev. Anheuser-Busch InBev previously held a non-controlling 50% in Modelo, and is buying the remaining 50% for $20.1 billion. This deal should be finalized in the first quarter of 2013. When completed, it means that virtually all of Mexico’s beer, bar a few small specialist breweries and microbrews, will be in the hands of European firms. Microbreweries include Pepe’s y Joe’s in Mazatlán; Cervecería San Ángel and Cervecería Santa Fe Beer Factory, both in Mexico City; and the Beer Lounge, in Guadalajara.